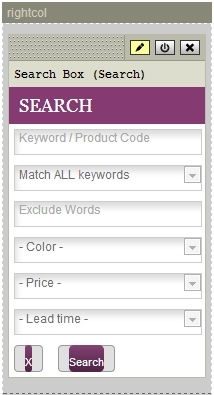 Your Customer Focus STORE website has a configurable Search module which can be placed anywhere on the page. Here's how you can edit it, and how to make it reference your page content as well as products. Step 2: If you do not have a Search module on your overall layout, you can add it here. Choose Search Box from the top left drop down list of available modules, and click on 'Insert Module'. Step 3: Alternatively, click on the 'Edit' icon on your current Search Box. Step 4: The check boxes show you what options can be used as search criteria, and what information to search. Check 'Include pages on search' if you want your customers to locate relevant pages you have created as well as products. 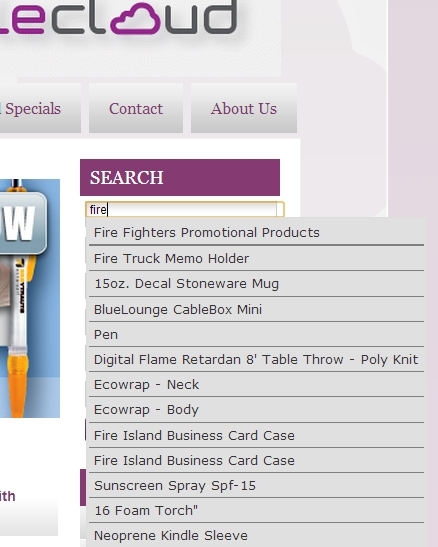 For example, if you have created landing pages to promote Fire Fighters' Promotional Products, you would probably want these pages to be listed in search results as well as products. Note that pages will only show up in search results as long as the 'Use Autocomplete Keyword Lookup' option is checked. Step 5: Click Publish at the top right to save any changes. 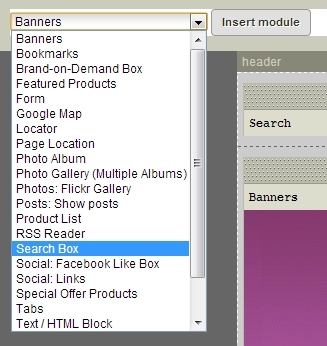 Step 6: If you have chosen to include pages in your search results, you'll need to indicate which pages are searchable. To do this, go to Content > Pages and then click on 'Attributes' on the page you want to make searchable. Step 7: There are two steps needed to make a page searchable. Firstly you need to add in the key words and phrases you'd like to make the page found under. So that you can be specific about which pages are indexed, you add these words and phrases in the Meta Keywords field. Secondly you need to check the box which reads 'Visible in search results (Search box module). Step 8: When you use the Search module on your website, page results appear at the top, distinguished by a bolder line.